I am trying to get this quilt finished by Christmas. And it's Christmas Eve today, so we shall see! This isn't actually a Christmas present, but a wedding present for my rather grown-up little sister who got married last May. I fairly obviously missed their wedding as the deadline for completing it, but they are coming to stay with us for Christmas and I'd love to be able to give it to them then. The pattern for the quilt is a slightly doctored version of Oh Frannson's Love Triangle Quilt. My sister asked for a king size quilt, which should have been sixteen blocks arranged in a 4 x 4 pattern. Each block involves 91 little triangles to be sewn together, so the full king size was going to be a huge job. I did cut out all of the triangles, but about half way through the tenth block I just hit a wall, and couldn't face sewing any more of those little beasts together. Instead, I joined my nine completed blocks into a 3 x 3 pattern, and added two six inch borders around the edge to make a king size quilt. I may use some of the leftover triangles to make a cushion to go with the quilt - when I've recovered from making this that is. I went really scrappy with the design, with almost 30 different fabrics, most of which had fairly bold patterns. 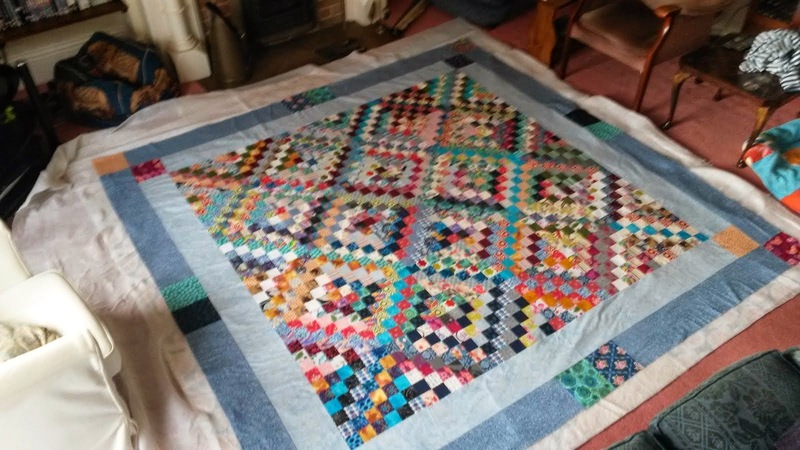 This means that the nine main blocks have turned out pretty loud, and the last minute borders around the outside have worked really well in the end to calm the quilt down a bit and give the eye somewhere to rest. I'm doing a few different quilting patterns; it's the first time I've got my free motion foot out in a good long while as I'm not very comfortable with it, but that'll only come with practise so I figured that I had to brave it sometime! I am mixing the free motion up with a bit of my conventional walking-foot-straight-line-quilting. I am just doing this on a domestic sewing machine - it's the second king size quilt I've done on it, and while it can be a bit unwieldy when you're stitching in the middle of the quilt I've generally found it easily doable to quilt something of this size on a normal machine. With a bit of luck and a fair wind, I'll be back soon to share the finished job! Linking up to Let's Bee Social and WIP Wednesday. If you know me... You know I love triangle quilts! Your king size triangle quilt is a beauty! Love the colour scheme you went with. Your sister will be so happy! Wishing you and yours a very Merry Christmas! That's a lot of triangles and your love and bond for your sister is tightened with each stitch. What a wonderful way to end the year.